Output 1200L/Hr (20 L/min). Genuine Hailea product with Australian plug and full warranty from our local suppliers. Complete with�4 outlet plastic manifold/outlet divider including�small length of connecting tubing (approx 100mm length). Adopts high aluminium alloy to shape the case. Double damping system and noice-absorbing function. High performance and low in noise. Double flow bars to produce large quantity of air and strong air pressure. Non-oil lubricated design to provide pure compressed air. Unique structure,quick in heat dissipation. Complete waterproof structure,no water leak in. In order to avoid the water flowing back,the pump must be put above the water level or install the checkvalve on the outlet pipe. Adopt non-oil design,without adding any lubricant. Size: 212 x 192 x 170mm. Output 1800L/Hr (30 L/min). Genuine Hailea product with Australian plug and full warranty from our local suppliers. Output 3600L/Hr (60L/min). 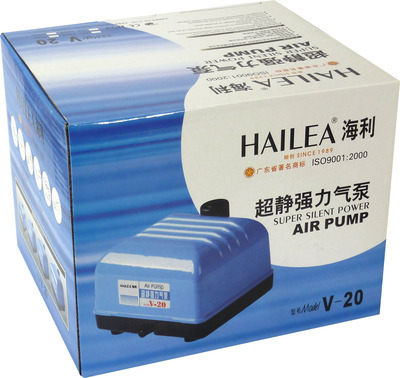 Genuine Hailea product with Australian plug and full warranty from our local suppliers.